United States Navy Lieutenant Commander A. Francis Birch (August 22, 1903-January 30, 1992) labels the assembled "Little Boy" bomb dropped on Hiroshima with "L-11" as physicist Norman F. Ramsey, Jr. (August 27, 1915 - ) looks on. Note the Military Police in the background. One of the few interior photographs of the "Little Boy" device. Birch was the assembly team leader and Ramsey was the scientific and technical deputy to Captain (later Rear Admiral) William Sterling "Deak" Parsons (November 26, 1901 - December 5, 1953) who led Project Alberta, the subgroup of the Manhattan Project that weaponized the bomb into an air-deliverable aerodynamic package. 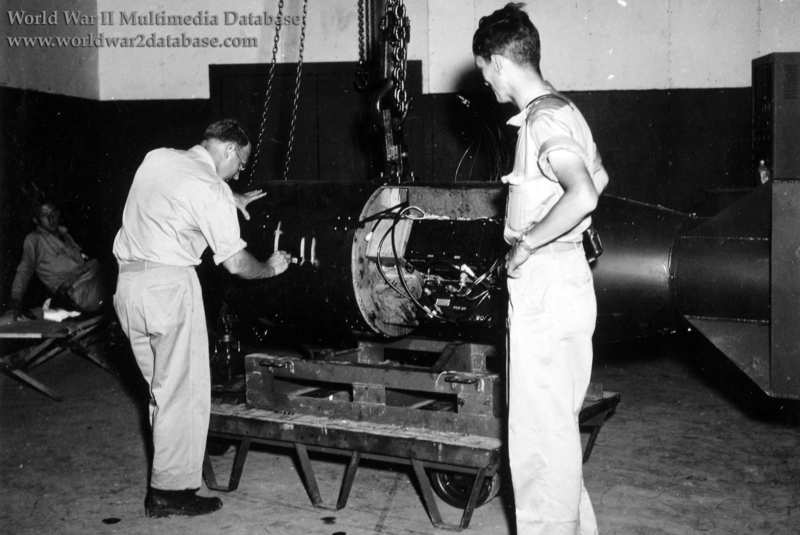 Ramsey chose the Boeing B-29 Superfortress in June 1943 as the only United States Army Air Force aircraft capable of delivering the expected size and weight of the bomb. Parsons, who worked closely with J. Robert Oppenheimer, the civilian head of the Manhattan Project, figured out the gun-type explosives necessary to create critical mass with almost all of the existing Uranium 235 isotope. Birch accompanied the U-235 target, which for safety reasons was flown in three parts from Kirtland Air Force Base, New Mexico, to Tinian; it arrived on July 28, 1945. On August 5 Birch supervised the assembly of the Little Boy device and loaded it into the specially outfitted B-29 heavy bomber named Enola Gay. On August 6, 1945, this bomb was dropped on Hiroshima. Parsons's and Ramsey's design was so sound, the first time the assembly was tested was when it was dropped on Hiroshima. It was never used again; the expense and time it took to make U-235 was too great. On August 8, Birch left Tinian, carrying secret reports from Ramsey to Oppenheimer. Hiroshima Prefectural Industrial Promotion Hall, the "Atomic Bomb Dome"